Welcome to the November edition of The Peaceful Runner Newsletter. As you have probably noticed, I have updated my newsletter to a new email format. I welcome your feedback, comments and suggestions here: Contact Us or add your comments below. 3) Are you Injured and Unable to Run? "My body will help me achieve my goals." -- Our body contains a great source of wisdom and guidance. Tap into and trust its knowledge to help you achieve all your goals. How can increasing your body awareness keep you running injury free? The answer is simple. If we don't know what our body is doing when we are running, how can we prevent getting injured? Our bodies send us signals (messages) all the time -- knee pain, leg cramps, back ache, tight hips, etc. Are we listening? Or do we reject the message, try to ignore it and hope it goes away? Instead, can we accept these signals without judgement and explore them? Can we give them our full loving attention? Truly loving and caring for our body and accepting all its discomforts and its strengths as they are, can bring about great wisdom and changes in how we move and how we feel physically and emotionally. When we feel great, we can enjoy running more. As we develop our body awareness we also become more aware of our inner-self and our true origin. We can discover our true potential and we will become stronger mentally, physically and spiritually. You can trust the wisdom of your body. 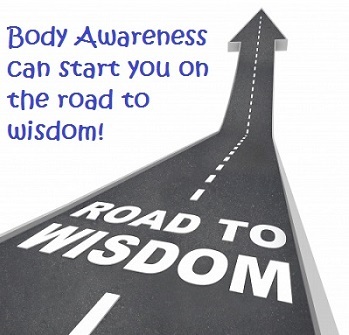 How can you strengthen and develop your body awareness? Start by giving your body your full attention and focus whenever you are moving. Even if you are just walking across a room, place your awareness on your body. It has great wisdom to share and giving it focus keeps you in the present moment. When you want to make a stronger, deeper connection, practice a body awareness meditation. It is a very effective method of strengthening your mind and body connection. Read more about how Body Awareness Can Help You Become an Injury Free Runner and try a free Body Awareness Meditation video. The Feldenkrais Method is another great way to increase body awareness. It is also very helpful in injury recovery and improving mobility and ease of movement. Are you Injured and Unable to Run? Are you currently suffering from an injury and are unable to run? The "100 Up Exercise" maybe able to help you keep your fitness and improve your running technique while you are recovering. If you can walk without pain, you can probably do this simple but effective drill. And even if you don't have an injury, you may still want to do this exercise as it will help strengthen and develop your running abilities and technique. The 100 Up Exercise was created by Walter George in 1874 while he was working as a chemist's apprentice and could only train during lunch hour. He developed the 100 Up Exercise and practiced it daily. By year 2 of doing this exercise, he was the fastest amateur miler in England. By year 5, he held multiple world records for various distances up to 10 miles. This exercise is very easy to learn and only takes a few minutes. There are two videos below which demonstrate how to do the drill. 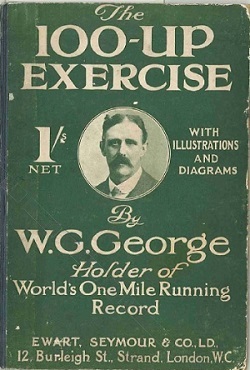 In 1886 Walter George set the world record for the fastest mile to which he credits the 100 Up Exercise. He later shared his training secret in a book aptly titled, "The "100-Up" Exercise. You can download a free copy of his book by subscribing to our newsletter. This recipe is a tasty way to use leftover ham. It is comforting and satisfying dish and bakes in only 10 minutes. Cook noodles according to package instructions. Add asparagus in last minute of cooking. Remove from heat, drain, add peas and stir. Combine flour, thyme, salt and pepper in a medium sized bowl. Slowly stir in milk and then broth. Mix well. Melt butter in a saucepan and add onions. Cook until onions are soft. Add milk mixture and cook until mixture thickens, stirring constantly. Remove from heat and add juice. In a large bowl, combine pasta mixture with milk mixture. Add ham and parsley. Stir gently to combine. Spoon into a 2-quart casserole dish and sprinkle with Parmesan and breadcrumbs. Bake for 10 minutes in preheated oven. Until next month, keep running and stay happy and peaceful!